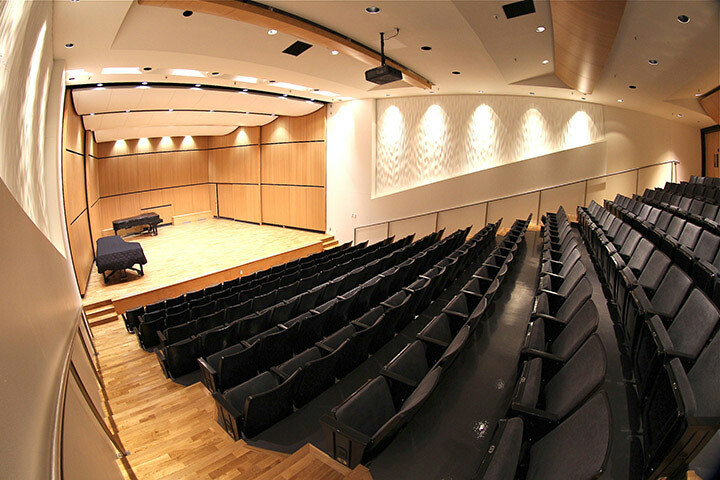 The University Recital Hall, renovated in 2014, hosts concerts, recitals, masterclasses and lectures and has been enhanced acoustically and technologically for recording purposes, networking to Studio One and an attached recording studio. Classes, rehearsals and audio projects are also booked in this space, seven days a week. The 201-seat hall houses two Model D, Steinway concert grand pianos which are performed on for the numerous concerts and recitals booked throughout the school-year. From free Music at Noon concerts held Tuesdays at 12:15 pm, to the Opera Workshop Sampler each fall, and the Faculty Artists and Friends concert series, the Department of Music fills the Recital Hall with music at every opportunity. Performers are expected to arrive no earlier than one hour prior to performance. Stage manager, front of house manager, and sound technician (as necessary) will arrive one hour prior to the performance. They will provide access to the Recital Hall and to the Green Room. Each staff person has jobs and tasks and will be working around you in the Recital Hall prior to your performance. They are there to help you, provide assistance, and to set up all parameters of the facility and performance. They will not restrict their movements on stage or in the seating to accommodate last minute rehearsals. You will be interrupted. The stage manager will request the times of all pieces and the length of intermission (standard intermission time is 15 minutes). You will be required to sign a recording release form for Department of Music archive purposes only. The Theatre does not provide video recording. Please make your own arrangements. Video recording is restricted to the back of the Recital Hall if using a tripod. Please check with Front of House for correct video recording placement. Front of House and stage management will not run any recording device on your behalf. The stage manager will finalize details of your set up for performance. Please indicate if you require a chair for a page turner, and any last minute needs. 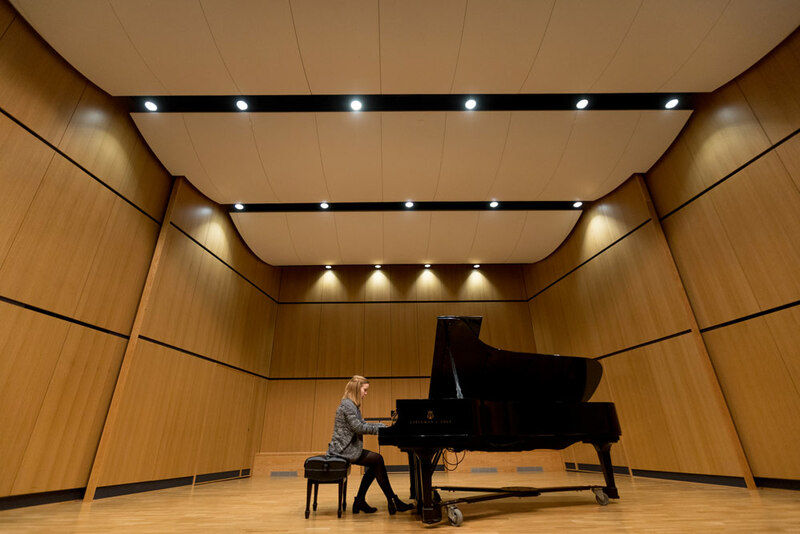 The Recital Hall does not have flexible lighting options for performance. You are restricted to the presets of the facility. All lighting discussions must happen two weeks prior to performance. Sound check will occur approximately 30 minutes prior to performance. You will need to select a portion of the program where sound is loudest. Last minute rehearsal at the conclusion of sound check is restricted to the amount of time remaining before patrons enter the Recital Hall. Please respect the directions of the stage manager and manage your time efficiently. The house will be open to patrons no sooner than 30 minutes prior to performance, and no later than 15 minutes prior to performance, or at the discretion of the stage manager. The stage should be clear of performers unless previous arrangements have been made. You will receive a 10 minute, five minute, and two minute call prior to performance time. Stage management and Front of House will coordinate the start of the performance. The stage manager will make any announcements to patrons, which include turning off electronic devices. The stage manager is there to set up equipment in between pieces, cue other performers and coordinate all backstage activities. They will not provide any photocopying or will leave the backstage prior to and during performance. At the conclusion of the performance, please gather all your belongings from the green room as quickly as possible. The stage manager, front of house manager and sound technician will lock all doors to the Green Room and Recital Hall within the hour after the conclusion of the performance. Recordings of your performance may be available to you within 30 days of the conclusion of the performance. Students with the necessary prerequisites may book available time with the Theatre Operations Supervisor in the Recital Hall for class-based work only. Access is provided through the Professional Audio Equipment Loan Centre after an orientation is scheduled and completed with the Theatre Technical Director. Please plan your schedule accordingly. Access is only provided through a booking confirmation, from Theatre Operations staff or by your instructor. Security Services will not provide access.